This 4" round Grateful Dead bumper sticker is proclaiming exactly what it is all about. 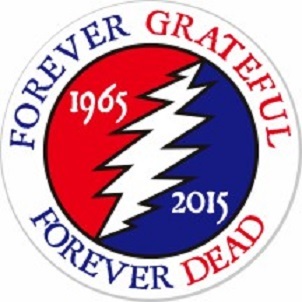 Forever Grateful - Forever Dead. Weather resistant, so you can put it anywhere. I am totally pleased with the stickers and I'm very glad to have been able to locate it as I was having a lot of trouble. I was told that this sticker was not being made anymore. My only suggestion would be to enlarge it just a little. It's smaller than the one I used to have. Thanks.